David Terrill sent in his new c64 project. It’s almost an end-all c64 mod. He lopped off the back half of the case, added s-video, a piggybacked secondary sound chip, 1/4″ audio, stereo input, audio feedback, a serial port, DIN sync… and more. If you dig c64s or hardware bending, check out his write up. 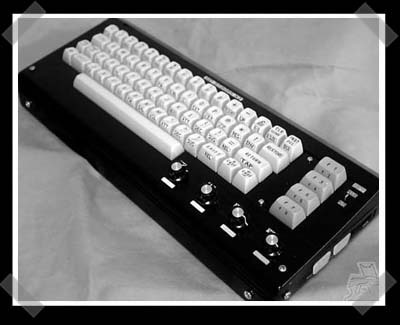 This is cool, all c64 mods are! That look amazing…. Whats the big obession with first post? awesome! more hacks like this! This is definately a good hack, since, unlike other ‘hacks’ i’ve seen (which involve ripping the guts out and replacing it with a pc), this guy keep the c64’s basic functions basically intact. He upgrades the video output (s-video) as well as showing interesting mods for the SID chip(s) that he placed in the machine. All in all, a good hack with consideration for the original functionality the machine. I hope that he replaced the SID with one of the 1st revision ones. They sound a lot better. well, as you can clearly see in the in-depth article that he uses 8580R5 SIDs. it’s the latest revision of the SID chip. I’m a younger geek, and not trying to flame but what exactly is the point of using C64’s as sythesizers… and what kind of audio quality would it have after the SID Piggybacking? What an amazing mod. Technically, it’s like 6 mods plus a prophet64 installation guide. Just… wow. As for US ones, some light googling might turn one up – or at least a schematic or two. I’m also a younger geek, but I can do research. In the electronic music world, unique sounds are vital (musicians are known to collect toy keyboards along with old record albums for source material), and the SID sound chip is … very unique. As an added bonus, a great deal of software has been written to take advantage of this. The Chiptune scene that has pheonixed in popularity lately is only adding fuel to the fire. Similar mods have been done to the NES. Remember to that this is an analog synth… something that is less and less common. Analog devices just sound different from digital ones. I assume it is because they are somewhat less precise but that lack of precision creates a unique and maybe more “organic” (whatever that means) sound than digital ones. Sure you could probably almost reproduce the sound with some clever effect programming but that would require better hardware/software and would probably never get it quite right. Read up on any band that uses synths extensively and you will probably find that lots of musicians have very strong opinions about getting a particular synth sound just right. Plus analog synths are just cool in general. Dang, I wish I still had my C64. Those were the good ol’ days! They’re reasonably easy to find if you want one again for yourself!